Can you believe it came out in 1994? 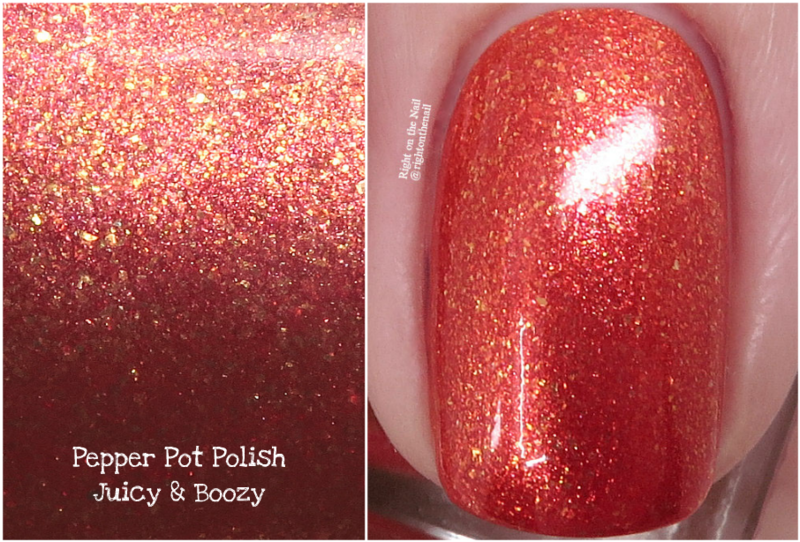 Anyway, Pepper Pot Polish's Juicy & Boozy will retail for $11 and has a cap of just 100 bottles. You know I love orange polishes, so this one feels like it was made for me! Juicy & Boozy is a blood orange base with gold flakes and shimmer. It will lean a little more red or orange depending on your skintone and lighting. It basically applied itself in just 2 coats, and it dried with no texture. What more could you ask for? You need to add this to your wishlist this month. Just imagine how this will look during the summer when you get a bit more sun? It would also make a beautiful pedi color! With a cap of just 100 bottles, there's definitely a chance this may sell out next Friday. You can find out more about Pepper Pot Polish on their website, Instagram, Facebook, or Facebook Fan Group. If you're wondering what's with this whole Polish Pickup thing, make sure to check out the PPU Facebook page and website to learn more. Don't forget, shipping is just $3 for US orders and $5 for Canada orders. Oh, and if you are in the UK, there is now a new website for you!